It’s soooo cold here! (read: below 75 degrees) So, I’ve been really into soups lately, if you can’t tell. 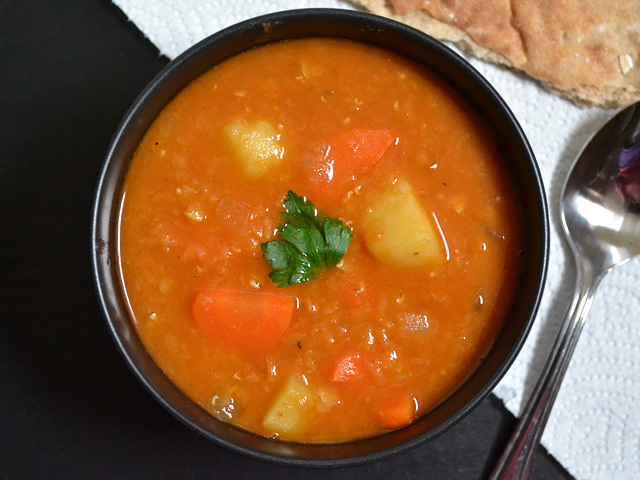 Earlier this week I got an email from Lindsay with a red lentil soup recipe that she had found on Bodyrock.tv (link may be NSFW) and it looked scrumptious! Seeing that I had a big bag of red lentils in my cupboard, I had to make some. Well, I have to say that this Vegan Red Lentil Stew turned out phenomenal. 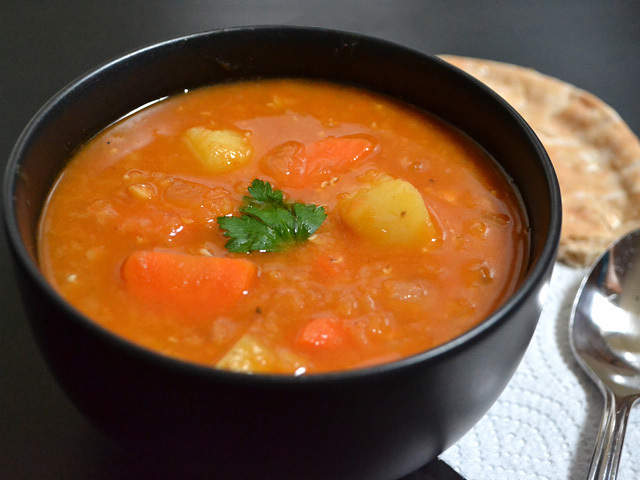 Serve this Vegan Red Lentil Stew with some hearty bread (or pita like in the pictures) to make sure that you have complete proteins. Legumes + grains = all of the amino acids that you need. 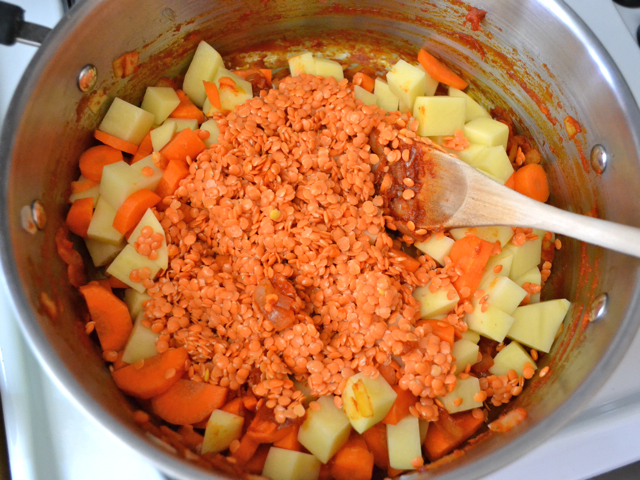 Aso, make sure you get red lentils and not brown or green for this recipe. 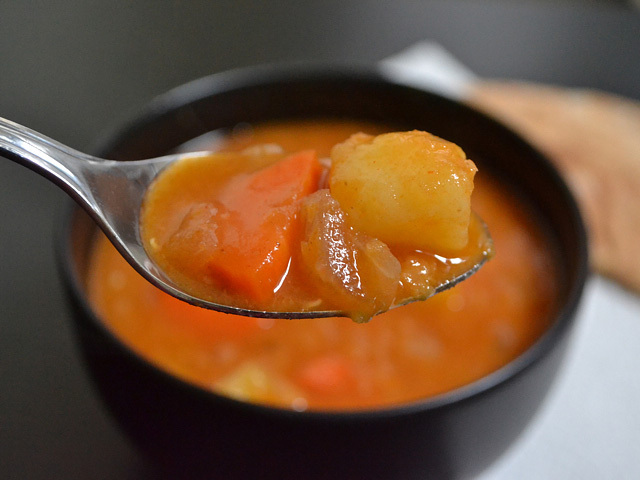 Red lentils break down very quickly when cooked which is what makes this Vegan Red Lentil Stew so wonderfully thick and hearty! 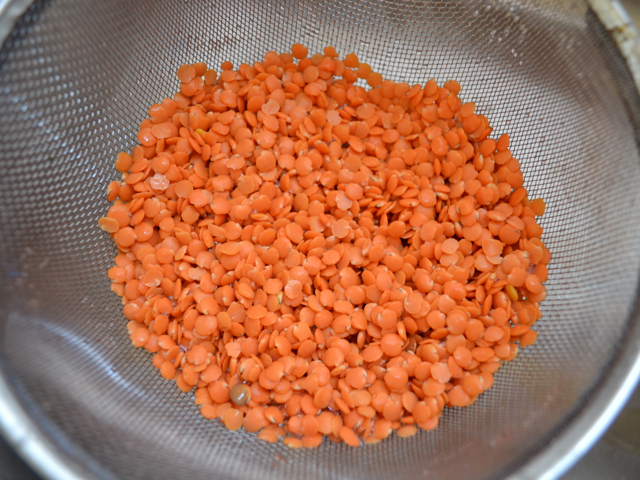 Even though I probably over paid for these red lentils, can you believe how inexpensive this is? I mean, WOW. 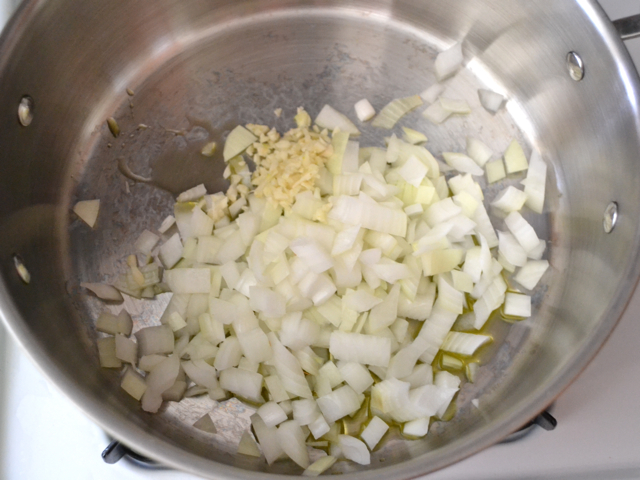 As always – dice the onion, mince the garlic. Cook both with olive oil over medium heat until soft. 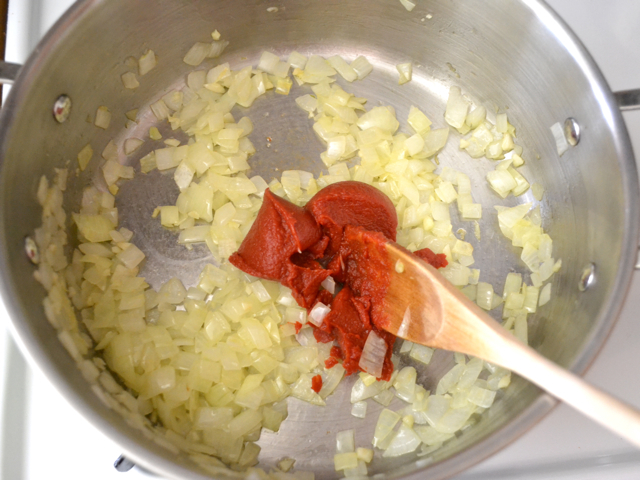 Once the onions are soft, add the tomato paste. It will start out very bright red like this. (Don’t toss the rest of the tomato paste in the can, it can be frozen and used later). 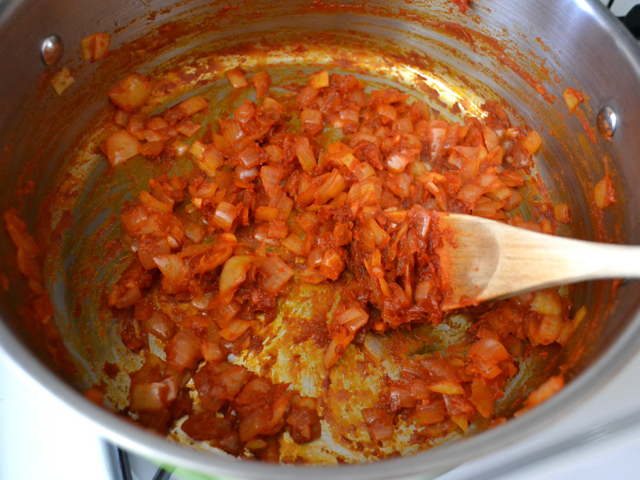 Continue to stir and cook the tomato paste with the onions for 3-4 minutes. It will get a little dry and turn a deeper shade of red. That’s what you want. Make sure to stir often (although continuously is not necessary). While all of that is going on, peel and dice the potato and carrots. 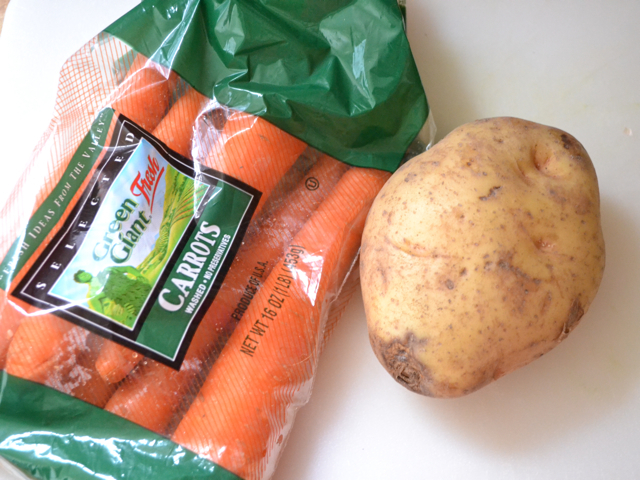 I used a half pound of carrots, which is about 3-4 medium carrots or half of that bag. Also, as with any dry bean product, make sure to give the lentils a good rinse. They’re so small that they’d slip through the slits in my colander, so I used a wire mesh sieve. Add the potatoes, carrots, and lentils to the pot. Add six cups of vegetable broth, cumin, smoked paprika, and cayenne pepper. Stir everything well to make sure the tomato paste is dissolved in. Put a lid on top, turn the heat up to high, and let it come to a boil. 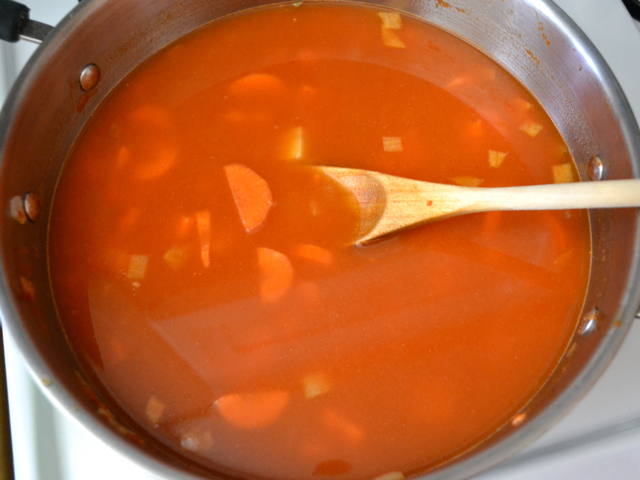 As soon as it reaches a boil, turn the heat down to the lowest setting and let it simmer there for 30 minutes (with the lid on). After it has simmered for 30 minutes, the lentils will have soaked up a lot of the liquid and gotten all nice and soft. Stir everything together. Add the salt, starting with just 1/2 teaspoon, give it a taste, and then add more if desired. Quite hearty and delicious! 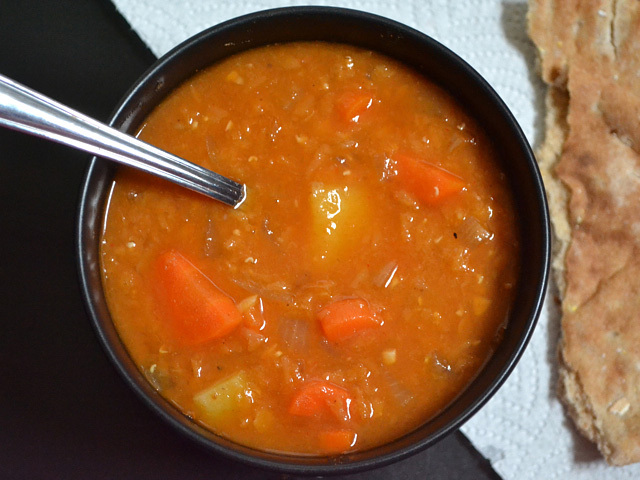 Vegan Red Lentil Stew for the win. This soup is fantastic! I’ve made it twice so far and it’s my fav. So healthy and soooooo easy and best of all so inexpensive. A definite winner :) thanks Beth! I love your website. My sister told me about it and I am a FAN. I was wondering if the recipes would be compromised in any way if I halved them. Six cups of soup is daunting to a person cooking for one. I just made this recipe for the 2nd time in a week! SO easy and cheap! We love eating this with avocado over the top. THANK YOU!!!! Looks amazing, can’t wait to try this. May I suggest that people can buy their red lentils in Indian grocery stores for cheap? Do you think black beluga lentils would work just as well? Also, should I soak the lentils beforehand? 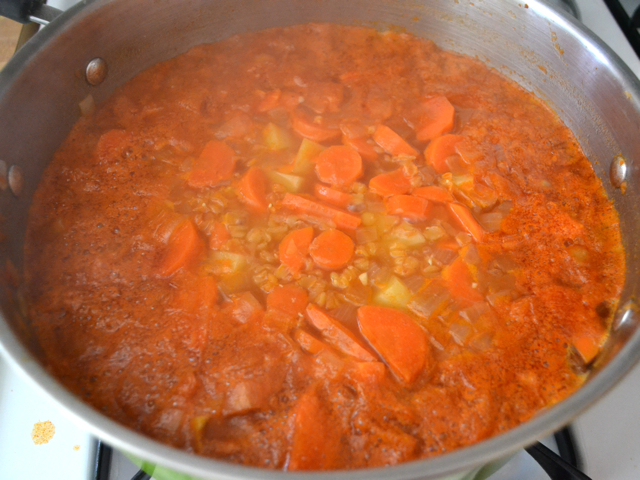 The good thing about the red lentils for this stew is that they break down a lot and make the stew thick. Black lentils tend to stay intact like beans. I made this with the addition of a few celery stalks I had on hand and it was fantastic. I served it with a loaf of no-knead bread for an easy Meatless Monday dish. I like this recipe…i used yellow lentils that my roommate had that looked reddish to me, anyways it turned out really good even if i didn’t get the consistency that was described. Paired this with your Everyday Cornbread and a salad. We are so grateful for your easy instructions and creative recipes. This will be a staple in our meal plan rotation! I made this last week and my husband and I loved it. He ate 3 bowls in one sitting! I just discovered your blog, and this was the very first recipe I tried. It was an instant hit around here, and I’ll be making another batch tomorrow–We love it that much! The only thing I changed was using sweet potato instead of white potato, which I didn’t have, and not adding any salt. It didn’t seem to need it. This will be a family favorite forever. I needed a soup to throw all my vegetables in before heading on break and this was perfect! I doubled the recipe and added a ton of mushrooms, it gives it a nice meaty flavor. Not quite as tasty as the Beth’s split pea or black bean lentil stew recipes, but definitely hits the spot! I just made this recipe but swapped out green lentils for the red, added peas and corn, and threw it all in the slow cooker. The end result was amazing!! !